Welsh rebel prince Owain Glyndŵr features on a new set of stamps for the first time in more than 30 years celebrating the British monarchy. Glyndŵr, who led a revolt against the English crown in the early 1400s, appeared on a Royal Mail stamp in 1974 for a series about medieval warriors. The latest offering was unveiled in Machynlleth, Powys, where Glyndŵr set up his parliament 600 years ago. The set also features the Battle of Agincourt, Henry IV and Richard III. Entitled The Houses of Lancaster and York, the stamps highlight the most significant individuals and events from the late 14th and early 15th Centuries, said Royal Mail. The Glyndŵr stamp was unveiled at the site of his parliament in Machynlleth. This was welcomed by Henry Evans, 90, chairman of the Owain Glyndŵr Centre, a museum which celebrates the Welsh prince's life. "It is wonderful that his place in history is being remembered on a stamp," he said. The stamp is part of a wider series called Kings and Queens, which will feature every British monarch over the past 600 years. Huw Roberts, director of the Royal Mail Group in Wales, said: "The miniature sheets that accompany each series of monarchs have strong educational appeal as some of the most significant events and personalities of the age are explored. 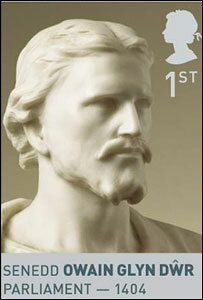 "We are delighted that Owain Glyndŵr is featured on the very first set."